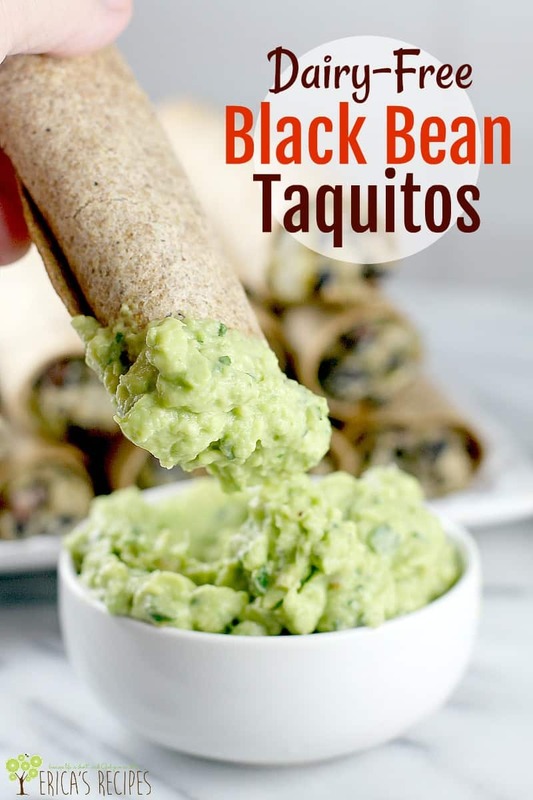 These wholesome, family-friendly Dairy-Free Black Bean Taquitos, with a creamy black bean filling thanks to dairy-free Cashew-Lime Ricotta, are just what we need to get our 2018 off to a super start. If you have resolved to prepare more plant-based, less dairy, healthier, lightened-up recipes this year, then this is the recipe for you! Alrightie everyone, this is my third dairy-free/vegan recipe in a row in the past month. So, if you can see the trend, you are correct. Not that I’m going all the way vegan again, I’m not (and my next post will have cheesy banging football food, because I’m all about balance). BUT for 2018, I HAVE resolved to eat healthier again, shed my extra “padding” from last year, and get back in shape as I come back from a torn hamstring and 6 weeks off from running. I also want to do this for and WITH my family because they need to eat healthier too. Seriously. And one thing that I know works is healthier little recipes like this. Easy to make. Quick to make. And on a busy weeknight, they just get scoffed up, shoved down, devoured. Mission accomplished. At least for this past Tuesday. 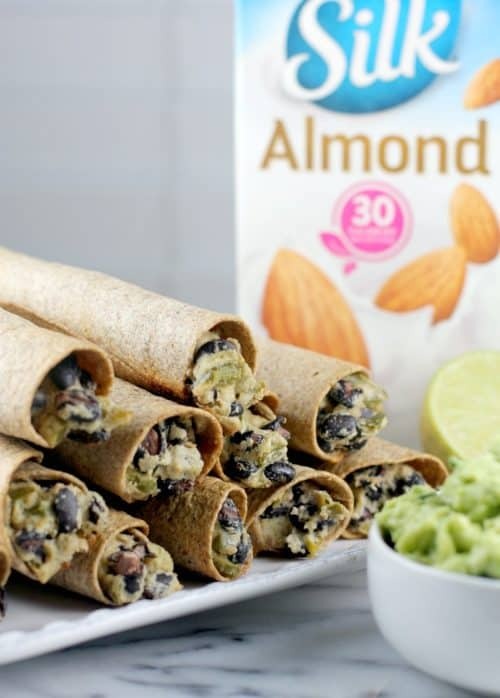 I have partnered with Silk for these Dairy-Free Black Bean Taquitos, specifically Silk Original Unsweetened Almond Milk (though, I also use the Silk Vanilla Unsweetened Almond Milk in my morning coffee and smoothies because it’s tasty and like half the calories of diary milk – that’s a handy trick right there!). 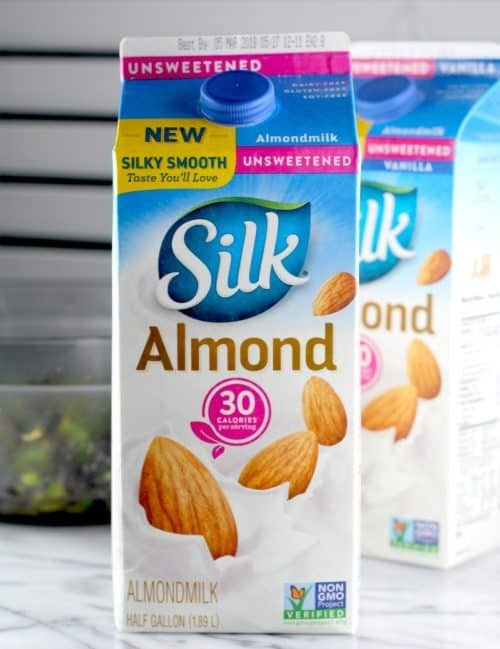 Silk Almond Unsweetened Original is dairy-free, lactose-free, GMO-free, and has 50% more calcium than dairy milk. It is also a good source of antioxidants (it is isolated from a nut afterall), to help us glowwww. Every time I have given you a vegan or dairy-free recipe with one of my dozen versions of a creamy “ricotta” or otherwise cashew-based cream sauce, I have each and every time used almond milk to adjust to the right consistency for that recipe. Also, I am going to adopt Silk’s “Progress is Perfection” campaign idea to fight the notion that “extreme” is the only path to being healthier. Small victories are still victories and still moving forward. I tend to be all-or-none, and that kinda sets me up for failure …or at least occasional self-loathing when I fail to live up to my own expectations. SO, in 2018 I am also resolving to embrace that two-steps-forward, one-step-back is okay. Because that is still moving forward, which is better than I did last year. 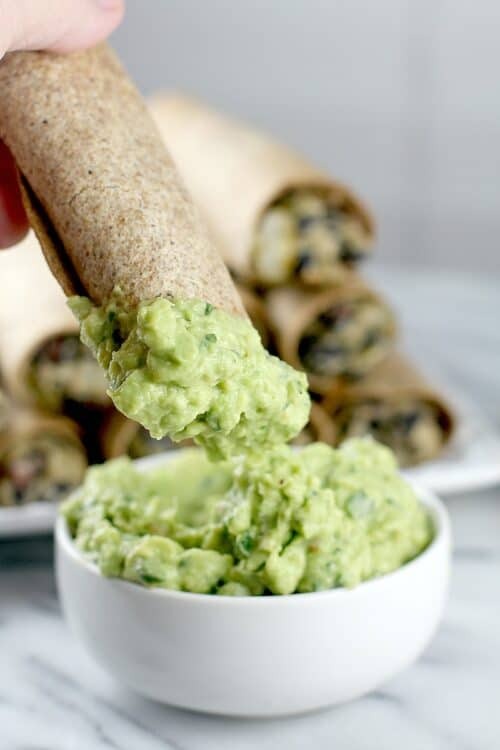 So what else is going on here with these Dairy-Free Black Bean Taquitos …it’s EASY. First of all. So easy that this recipe is a perfect weeknight dinner even. First, we blend up our Cashew-Lime Ricotta. Raw cashews, after soaking in water for a while, blend up to a magical substitute for dairy, so I made use of that phenomenon here. Then we combine that with black beans (also creamy), green bell pepper (for crunch), green chilies (for flavor), and some herb and spice. 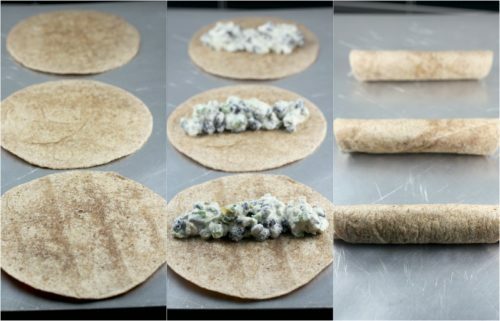 Then we make our taquitos using little whole wheat tortillas, spray with cooking spray, and bake until crisp. Done! I have served these with Guacamole when I have made them, but salsa or salsa verde would work too. And you can change these up however you like – add spinach, change up the veg, whatever. Regardless, you have yourself a light, kid-approved (Yes! ), healthier way to get your taquitos on with zero regret. That’s it folks! My first post of 2018, and it is an easy, no-brainer. You want a New Year, New You? Then this is the recipe to help get you there. 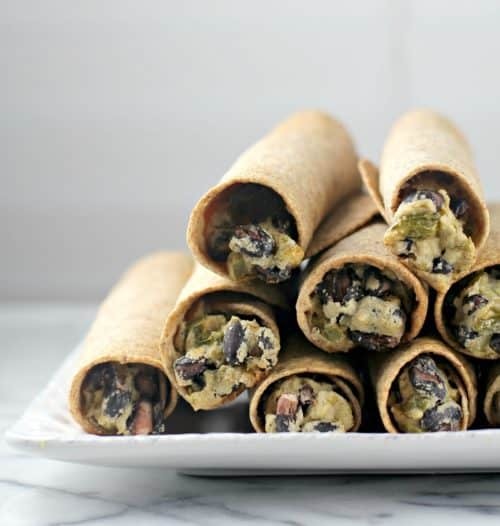 Wholesome, family-friendly Dairy-Free Black Bean Taquitos, with a creamy black bean filling thanks to dairy-free Cashew-Lime Ricotta. 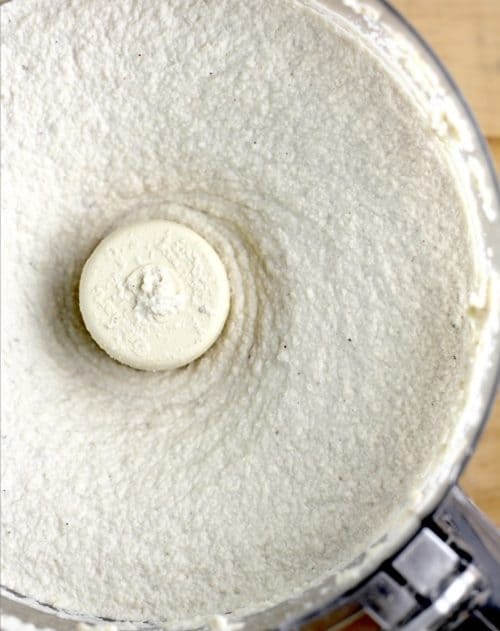 In a food processor, blend the ingredients for the Cashew-Lime Ricotta until very smooth. 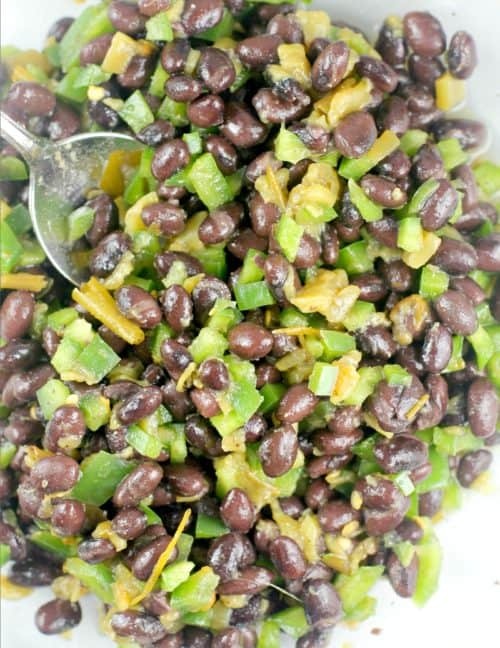 In a large bowl, combine the ingredients for the Black Bean Filling. Add the Cashew-Lime Ricotta. For each taquito, lay out a tortilla and put a scant 1/4 cup of filling down the center. Roll up the tortilla, spray with cooking spray, and place on a large bake sheet. Repeat with remaining ingredients. Bake taquitos at 350F for 30 minutes or until crisp. Serve with guacamole or salsa. Yields: 16 taquitos. I have made this recipe with regular green chilies or with canned Hatch green chilies. Both work perfectly. For more inspiration, visit the social hub and Walmart’s site here. I got both my Silks at Walmart, as you can see below they were very easy to find. And leave me a comment! What have you resolved for yourself for 2018? Ricotta is great and can be used in so many different dishes. I’ve never seen cashew lime ricotta before. These look amazing!!! I need to try making taquitos at home!! I know that my kids would love them!! I am going to share this recipe with a good friend who is vegan. I admire her determination to eat healthy and I wish I had the same level of determination too. I think this black bean taquitos would taste heavenly. Me and my friend should make this together. That ricotta looks absolutely mouth-wateringly delicious!! I haven’t had taquitos in so long I’ve almost forgotten what they taste like. This sounds like the perfect snacking food for watching a football game — which for me, means snacking and not watching football! I love how easy and healthy this recipe is. I think mostly everyone resolves to start off the new year eating healthy and this is the perfect recipe to put that resolution into action! Love how healthy this recipe is and the wonderful flavors. I’ve been encouraged to go dairy-free due to inflammation. Enjoying these taquitos will make the trransition easier. Mmmmm! I love taquitos. I’ll have to show this to my daughter who can’t have dairy products! You know what, I’m not normally a fan of black beans, but this looks REALLY good! Thanks for sharing this recipe! Omg… these look amazing! I used to look taquitos when I was younger but haven’t had them in awhile. Maybe I will try these for dinner one day next week.